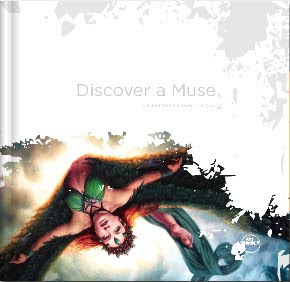 The book from the "Discover a Muse" contest I entered back in May has been released. And yours truly is on the cover. Okay, not exactly yours truly... the world isn't quite ready for that... but the next best thing: a painting by yours truly did end up being chosen for the cover. Big thanks to Jon and Veronika for making this happen. All the info on how to order the book can be found on the Art Order blog. That was a fantastic painting Michael and is being put in the place of tribute for it's goodness. Many of the submissions were nice but I think yours was the coolest composition overall...AND....it's a traditional painting on top of it all. Not that there is anything wrong with digital. 8^)) Congrats! !